Gt Yarmouth Jetty tower mill was also known as York Road Mill or Papworth's Mill. It was built with 6 floors with a 7th floor having been added by 1838. The mill had a Norfolk boat shaped cap with a petticoat and a fantail. 4 double shuttered sails, each with 9 bays of 3 shutters powered 3 pairs of French burr stones a dressing machine, a flour mill and a jumper. A stage was set around the 4th floor. By 1864 a steam engine and mill driving two pairs of French burr stones had been installed on the site to increase capacity. and one extra pair stones. Rye considered this to be the last mill working on the Denes. A Superior Brick TOWER WINDMILL with Patent Sails, built in the most substantial manner, containing six floors, drives three pair of French stones, flour mill and machine, granary with two floors, good Dwelling house, Cottage, three-stall stable, cart house, piggery and two yards well enclosed. The above property is situate on Yarmouth Denes and has been built about four years. Mr. Morley on the Premises will shew the Estate. Apply to Mr. Wm. Butcher, Auctioneer & Land Agent, Norwich. from Wednesday 11 March to Wednesday 18 March. To be Let with Immediate Possession. For 1, 3 or 5 years. A Brick TOWER WINDMILL with patent sails and three pair of stones., Also a Dwelling house, Cottage and Granary adorning the same. The above property is situate on Yarmouth Denes and in complete repair. Apply to Mr. Butcher, Auctioneer, Norwich. 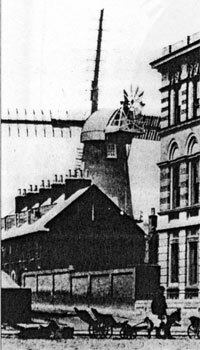 A Capital Brick TOWER WINDMILL situate on the Denes, Great Yarmouth withy a Dwelling house and other premises adjoining, late in the occupation of Mr. John MORLEY. Leasehold of the Corporation of Yarmouth. Apply to Messrs. SEWELL, BLAKE, KEITH & BLAKE, Solrs. Norwich. By Order of the Commissioners in a Commission of Bankruptcy against JOHN MORLEY. A Superior Brick TOWER WINDMILL with Patent Sails, built in the most substantial manner, containing six floors, a Granary with two floors, a good Dwelling house, Cottage, three-stalled Stable, Cart house, Piggery and two yards well enclosed. The above property is situate on Yarmouth Denes and has been built only about four years. It is Leasehold of the Corporation of Yarmouth for a term of 21 years which commenced on the 29th day of September 1825 and was late in the occupation of Mr. John MORLEY, the Bankrupt. Annual Ground rent to the Corporation £5. 5s. Apply to Messrs. SEWELL, BLAKE, KEITH & BLAKE, Solrs. Norwich; of Mr. Wm BUTCHER, Land Surveyor, Norwich, Norwich; & at the Place of Sale. It is possible that William Butcher, auctioneer & land surveyor, bought the mill at the auction as he became the next leaseholder. Interestingly, he was not the auctioneer on that occasion. 1st Quarter. 3 months at 1s. 2d. per month. 3rd Quarter. 3 months at 1s. per month. Made 2 November 1830. Freehold Tower Windmill, Residence, Granaries etc. at Great Yarmouth. Mr. Butcher will sell by Auction at the Bowling Green Hotel, Norwich, on 26 May, 1838. A Brick Tower Windmill, with seven floors, excellent granaries and outbuildings, Genteel Residence and Cottage, pleasantly situated on the Denes, near the jetty, Great Yarmouth, now in the occupation of Mr. Benjamin Foreman, under a Lease which will expire at Midsummer 1839. For particulars apply auctioneer, Norwich. Mr. BUTCHER will sell by Private Treaty. A Superior TOWER WINDMILL, with seven floors, a comfortable Dwelling house and Cottage, pleasantly situate near the Jetty, Great Yarmouth and now in the occupation of Mr. FOREMAN. This Lot will be Sold to Pay a Good Rate of Interest. A Capital TOWER WINDMILL in complete repair, driving three pair of French Stones, with Dressing Machine, Flour Mill, Jumper, Sack tackle, Warehouse and Dwelling house attached. Also with or without a Retail Flour & Corn Shop with Granaries, where a first rate retail trade has been carried on for many years. Immediate possession may be had if required. Apply to Mr. Wm. BIRD, Corn factor, Great Yarmouth or to Mr. E. FOREMAN, Miller, Pakefield. WANTED, a Practical MILLER, one preferred who understands working a Steam Engine. Apply to Mr. William Sexton, Miller, Yarmouth. WANTED, a JOURNEYMAN MILLER, a middle aged man and a good Stoneman. Enquire of William Sexton, Counting House, bottom of Broad Row, Great Yarmouth. Enquire of William Sexton, Counting House, Opposite Broad Row, Yarmouth. A TOWER WINDMILL with three pairs of French Stones and a STEAM MILL with two pairs of French Stones and all going gear complete. Large House with Flour Shop and Stables. Also two Flour Shops in the town doing a large retail trade. A Large Corn Trade. Present owner declining business having been in it many years. The Mills are situated on the Denes near Old Jetty, Yarmouth. Claims against the Estate of William SEXTON, late of Great Yarmouth, Miller, deceased to Mr. Charles DIVER, Solr. 23 King Street, Great Yarmouth. 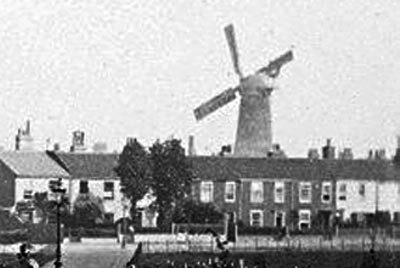 A capital BRICK TOWER WINDMILL with the Mill Yard in the occupation of William SEXTON, lately deceased and a substantial DWELLING HOUSE and COTTAGE, with Stables, Granary, Cart lodge and other Buildings and Ground with BUILDING SITES, situate on the Denes, near the Regent Road. Further particulars in future papers and of Messrs. HOTSON & PAGE, Solrs. Long Stratton, Norfolk or of the Auctioneers, 8 Regent Street, Great Yarmouth. WOOLVERTON & GEORGE are instructed to Sell by Auction at the Star Hotel, Great Yarmouth on Wednesday next at 4 pm. 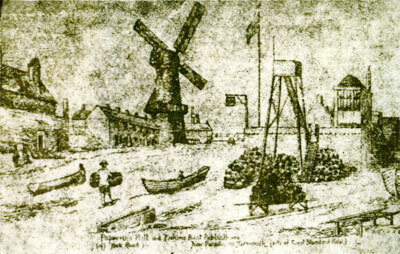 The property comprised in the following Lots 6 & 7 being all Freehold (except Two Pieces of Ground north and west thereof, which are Leasehold for Seventy five years from Michaelmas 1859 from the Corporation of Great Yarmouth) consisting of a capital Brick Tower WINDMILL with Mill Yard, in the occupation of William SEXTON, lately deceased . . . (and two dwelling houses) . . . Lot 6. DWELLING HOUSE on Albion Road . . . Tenure. Part of this Lot is Leasehold of the Corporation of Great Yarmouth for 75 years from Michaelmas 1859 and the residue thereof is Freehold. The Purchaser of Lot 6 is to erect a 9 inch wall 8 feet high dividing this Lot from Lot 7, which wall is to be the Property of the Purchaser of Lot 6. Corporation Rent for Leasehold part £3. Lot 7. The capital Brick Tower WINDMILL to the East of Lot 6 with the Mill Yard in the occupation of William SEXTON, lately deceased and substantial DWELLING HOUSE, Stable with Loft over, Cart Lodge and other Buildings and a Piece of valuable Ground. Corporation Rent Charge for part of this Lot £3. 3s. 0d. Further particulars of Messrs. HOTSON & PAGE, Solrs. Long Stratton, Norfolk or the Auctioneers, 8 Regent, Great Yarmouth and at their Stock Marts, Acle and Reedham. Of the Sale of a capital Mill in full going order, with Yard and Premises attached, Two Dwelling houses and Two Shops, each having extensive Frontages to one of the best roads in YARMOUTH. WOOLVERTON & GEORGE will sell by Auction at the Star Hotel, the above very valuable PROPERTY situate on the St. Georges Road, lately belonging to Mr. William SEXTON, deceased. Date and further particulars will be advertised next week and may be had of the Auctioneers and of Mr. Charles DIVER, Solr. Great Yarmouth. The following very valuable PROPERTY lately belonging to Mr. William SEXTON, deceased, situated on St. Georges Road in the best part of Yarmouth, comprising the "JETTY MILLS", one worked by wind being a brick Tower Mill driving three pairs of stones and the other worked by steam driving two pairs of stones, Engine room, nearly new Boiler, Shaft, Yard and all necessary Premises, Cart lodge, Sack room, Granary, 3-stalled Stable, Room in which is Oven, formerly used as a Bakers Shop and DWELLING HOUSE occupied by Mr. Charles PAPWORTH, whose tenancy expires at Michaelmas next, at an annual rent of £60. TWO SHOPS occupied by Mr. James JOHNSON and his under-tenant at an annual aggregate rental of £13. DWELLING HOUSE occupied by Mrs. SEXTON. The Auctioneers beg to call attention to the above Sale. It is a very valuable property as at present occupied and having an area of 5400 superficial feet and abutting on three good roads, it is a fine opportunity to purchase for Building purposes. Particulars of Mr. Charles DIVER, Solr. Yarmouth and of the Auctioneers where a plan of the Property may be seen. 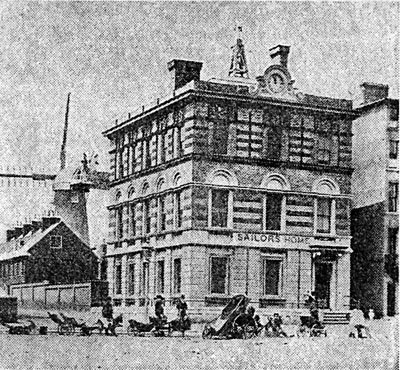 The Sailors' Home (pictured in 1870) is now the Maritime Museum for East Anglia. The building appears to have changed very little since then. But gone is the windmill seen in the old picture and of course there is No Parking . . . even for goat carts. All the GOING GEAR of a STEAM & WIND CORN MILL at GREAT YARMOUTH now being taken down, comprising 12 horse power Engine and Cornish Boiler, nearly new, Iron Wind & Upright Shafts, 5 pairs French Stones with all the necessary Wheels, Spindles, Chains etc. Messrs. SPELMAN have received instructions to Sell by Auction on Wednesday January 19, 1881 the MACHINERY & WOODWORK of the STEAM & WIND MILL known as "Sexton's Mill", St. Georges Road, Great Yarmouth (the Mill being now pulled down) comprising a Vertical Steam Engine 12 horse power, an excellent Cornish Boiler 16 ft. 6 in. x 5 ft. with 2 ft. 9 in. flue; a 6 horse power Vertical Steam Boiler, iron wind shaft, iron upright shaft, 5 pair French burr stones, one extra pair stones, 5 mill stone spindles and nuts, large spin wheel, bevel head wheel, flour machine, 3 sets of sack tackle and chain, a gun metal force pump with 2 ft. barrel in good order, iron shafting 2 feet diameter; 2 drums, large iron bevel wheel, iron pan, 9 stone of mill bills, a quantity of leather belting, scales and weights, lead pump, sack barrows, measures, sieves, about 400 sacks, old brass, the cap of the mill, wind gear, curbing and iron work, the wood beams used in the interior of the Mill and sundry wood, all of which may be viewed on the Morning of the Sale as lotted out. Sale to commence at 12 o'c at noon. Further particulars of Messrs. SPELMAN, Auctioneers & Estate Agents at Norwich & Great Yarmouth. Messrs. SPELMAN beg to announce that the Sale of Mill MACHINERY, Boilers, Engine and other Effects which were advertised for Sale on the 19th January and Postponed in consequence of the severity of the weather, is fixed for WESNESDAY NEXT, February 2, 1881 at 12 o'c precisely. Further particulars may be had at the Offices of Messrs. SPELMAN, Norwich & Yarmouth. 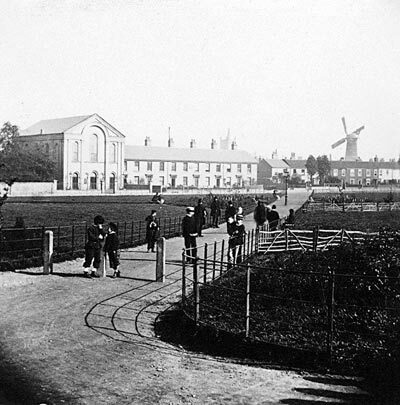 Papworth's mill (formerly William Sexton's & Foreman's) stood opposite St. John's Church until 1881 upon a site now occupied by the Central Boarding House and shops upon St. George's Road.